In 2012 Bermuda hosted 1.7% fewer air visitors and 9% less cruise visitors than the previous year, according to the Quarterly Bulletin of Statistics released today [Mar 25] by the Department of Statistics. 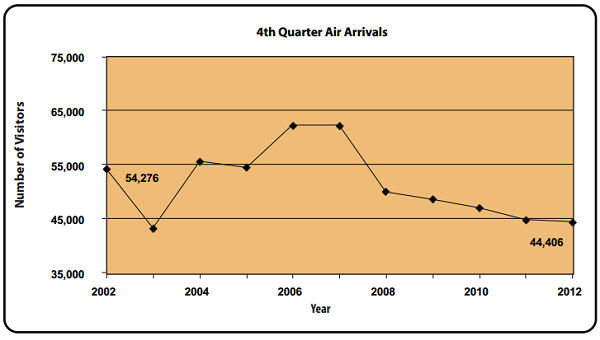 Air arrivals during the fourth quarter of 2012 decreased by 1% to 44,406 air visitors, and overall in 2012 the Island hosted 232,063 tourists who arrived by air, a decline of 1.7% or 3,975 fewer air visitors than in 2011. Total visitors from the United States, Bermuda’s largest tourist market, slipped 0.7% below the level reached in the fourth quarter of 2011. Arrivals from Canada decreased 3.2% to 6,778 visitors, arrivals from all other countries category declined 8.6% to 2,478 visitors. Conversely, air arrivals from the United Kingdom increased by 4.9% to 5,059 passengers. Air visitor spending declined by $2.4 million to $58.4 million in the fourth quarter of 2012, a 3.9% decrease. Air visitor expenditure in 2012 totalled $312 million, 10.5% lower than the level of expenditure reported in 2011. Cruise ship calls for the fourth quarter in 2012 dropped by half the number of visits experienced in 2011. The reduction was reflected in a 47.5% drop in visitors. In 2012, the number of cruise passengers fell by 9%. Visitors arriving by cruise ships during the last quarter in 2012 spent $7.4 million on local goods and services, $6.4 million less than the amount spent during the same period in 2011. In 2012, cruise ship passengers spent $80.1 million on goods and services, 7.2% less than in 2011. Gross receipts for the hotel industry fell by 1.9% to $40.9 million in the fourth quarter of 2012. Total hotel gross receipts in 2012 stood at $212.6 million, a decrease of $15.2 million compared to 2011. After the non-ruling on the KFC scenario, I realize why the 1980s UBP government dropped Tourism in favor of IB. Too many unecessary labor problems with the 1981 strike being the catalyst to the ruin of our #1 economic revenue generator. Goodbye Ariel Sands, Marriot, Elbow Beach, Trust House Forte, Princess Group, Sonesta, along with any prospect of new hotel properties. Now the BIU Hotel Division is toothless and hungry dog, alone with Construction Division. Otti the house you built is left desolate thanks to Crazy LudiCris. Colin Simmons or even Mr. Russell would have been better choices. Good luck to the Nelson Hunt and Co. and Greene Family. Make sure your employees start their own union. It could be that the labour cost and overheads in Bermuda is too high forcing up hotel prices. Obviously the Fairmont in Hamilton must be doing okay or why would the Greenes have bought it? But that is among the few. Why I think that hotel prices are too high is because I do travel a lot, but I tend to stay in smaller venues because of the price. Not to mention the fact that why in Bermuda are the smaller properties, tourist apartments and guest houses (mine included) are doing so well? It has to be the price and giving the customer what they want; a home away from home. All my friends that live in New Jersey, New York, Conneticut, Massachusetts and Pennsylvania (some of who are transplanted Bermudians) never ever see any advertising for Bermuda. They see adverts for Jamaica, Antigua, Bahamas, Cayman, St. Lucia, Mexico,Dominican Republic and Martinique, but never ever Bermuda advertised. Why is that? These destinations are all four or five hours flight from New England and the tri-state area. Yet Bermuda is less than two hours from most of the gateway cities on the East Coast. Why? Why? Why do they see no advertising from Bermuda? Well I can agree with you on that point. Let the key players run tourism; hoteliers, airlines, tour operators, etc., just give them the money as most of them have advertising already in place. Back in the 70s the hotels, airlines, tour operators and hotel entertainers all worked together for a common cause. Get the advertising where the fish are biting;New Jersey, New York, Conneticut, Massachusetts and Pennsylvania, and don’t forget the Canadians (especially in the winter). I think you will find that vacation rentals and small guest houses have really happy customers. It’s the type of business that was the core of our industry initially, i think that Cottage colonies, and house and apartment rentals are the beginning of a new tourism industry. I also think our advertising has not hit the mark. Our recall may be good, but that’s not when it comes to vacation planning. I seem to keep meeting visitors who can’t believe how close it is, and they say had they known they would have been coming here all the time. They all seem to be from east coast ny, nj, ct, ma, pa, etc. All properties are doing well as we have lost more then half our bed nights over the years and competition is limited so prices are likely to remain the same or go higher. IMO we are priced slightly high but certainly not outrageously considering we are still BERMUDA. The DOT has been a money pit and needs to be shut down …..I don’t think we would lose any MORE business either. Thanks Rick for your input. I thought last year was the best year yet for my guest house, but this year is turning out to be better than the last. The return visitors are either ex-hotel guests or ex-cruise ship guests. The smaller properties and guest apartments are the way to go. Vistors are looking for value and a home away from home. The key is advertising…..online, online, online is the way to go as tourists are searching online from their home computers for the best deals. Start thinking outside of the Box… Starting with Branding …Bermuda as a brand … Jamaica for example has its own music in advertising in Canada for the last 20 years at least … etc..